Students will apply their understanding of multiplying and dividing decimals. 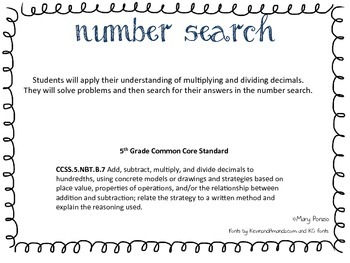 They will solve problems and then search for their answers in the number search. CCSS.5.NBT.B.7 Add, subtract, multiply, and divide decimals to hundredths, using concrete models or drawings and strategies based on place value, properties of operations, and/or the relationship between addition and subtraction; relate the strategy to a written method and explain the reasoning used.